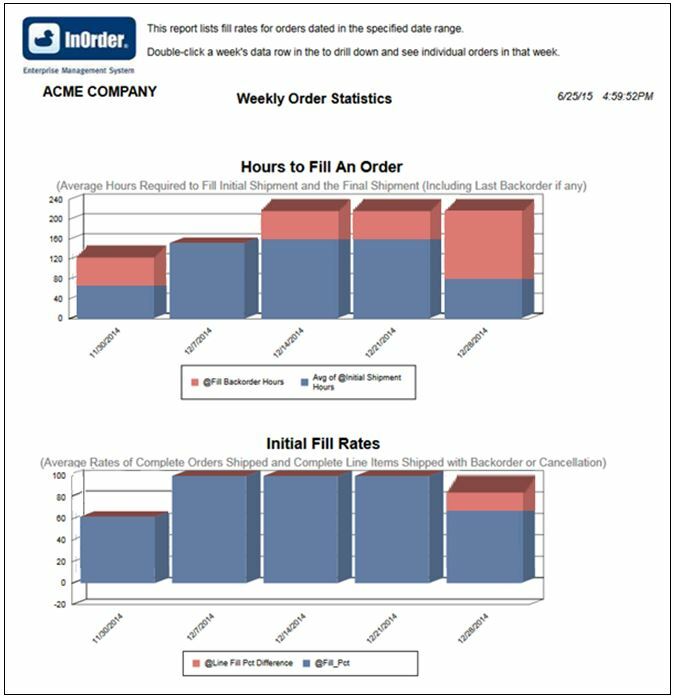 The F. Curtis Barry & Company, a consulting company that provides solutions for multichannel operations and fulfillment, recommends that multichannel companies use Initial Order Fill Rate (IOFR) to measure customer service and inventory availability by order. We agree. 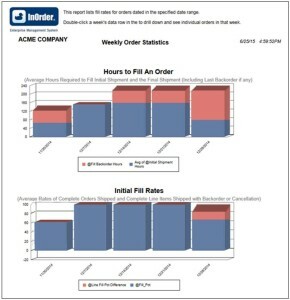 Both of these metrics are provided on InOrder’s Order Statistics Report. This data shows where you stand in regards to providing what customers expect – that inventory is available when ordered, and orders are shipped in a timely manner. Initial fill rates are shown for orders within a range of weeks that you specify, along with the average number of hours it takes to fill those orders. For the complete article by F. Curtis Barry & Company, click here. While the vast majority of your orders are normally printed in batch, there may be certain types orders that you print immediately every time you end them. 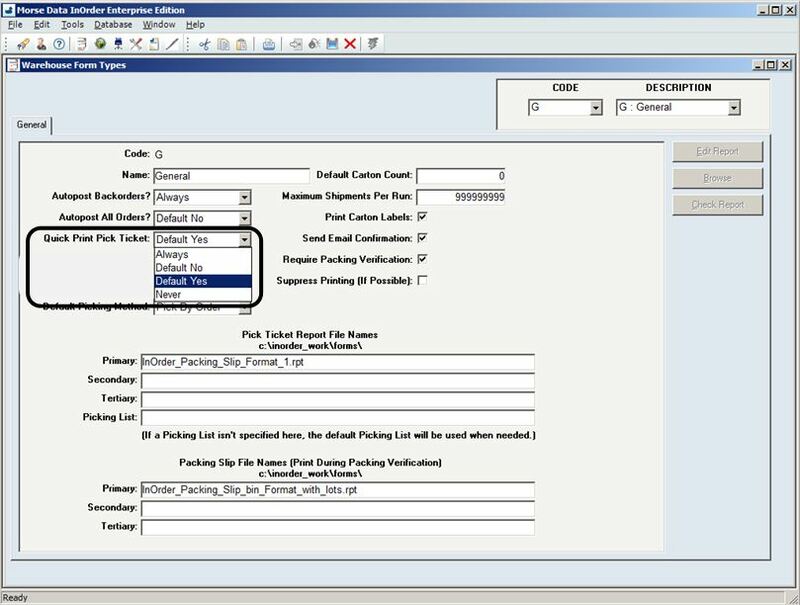 You can set up an InOrder Warehouse Form Type to ask if you want to print when you are ending the order (Quick Printing). The options are Always, Default No, Default yes, and Never. Quick printing can be tied to certain types of orders. For example, you can define an order class, for rush or special orders, which routes those orders to a Rush Warehouse Form Type that asks about quick printing the order. Quick Printing may be used for inventory transactions, as well. Other types of transactions that are often quick printed include warehouse transfers, obsolete inventory writeoffs, and kit assemblies. 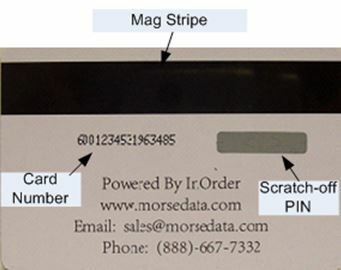 For more information about quick printing with InOrder, contact sales@morsedata.com. 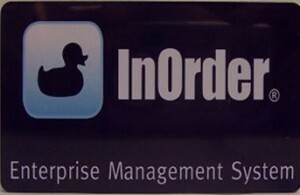 As of version 10.00.07, InOrder ERP integrates with the Pro On-Demand Address Verification service from Experian. This service uses a contemporary address validation technique, providing 24-hour address validation service in real-time via the Internet. If an address is entered with missing information, the Experian address validation even displays possible matches for the user to select. Businesses have been using gift certificates and gift cards for a very long time, and for good reasons. They’re convenient for your customers and profitable for you. They increase sales and attract new customers through gift giving. You can customize them with your logo and your message to put your brand in front of your customers and future customers. Here are a few benefits of using InOrder gift cards and gift certificates. Look for these features when you’re considering gift cards or gift certificates to support your business. Your customers may download gift card serial numbers from the web immediately after placing the order, or as an attachment in an Email. InOrder gift cards may be activated during line item entry, packing verification, or electronically at point of sale. Use InOrder gift cards with line item personalization and digital delivery to maximize your customization capabilities on E-gift card notification Emails. InOrder Gift Cards provide the ultimate in flexibility for your customers to provide confidence that their money is well spent with your company. Web customers can easily check the balance on their gift cards. PINs may be reset, and lost cards may be re-issued (not typically allowed with other pre-paid cards). Flexible refunds may be made either to the customer who bought the card or to the gift card recipient. Your customer service reps can lookup gift cards easily in the familiar InOrder lookup interface. They can check transactions on the gift card, values associated with a gift card program, links to the order or credit adjustments, and an audit trail of changes to the gift card. Reports provide gift cards sold, balances, transactions, and service fees. Strong security features include online e-PIN and card scratch-off PIN for secure redemption. 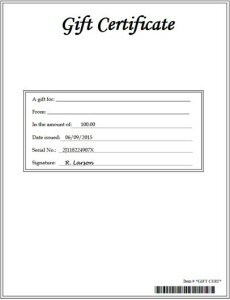 InOrder gift certificates may be customized to meet your requirements, so you can design them for promotions, loyalty awards, birthdays, graduations, or any other occasion or special event. They may be used on your web page or order window. Serial numbers are generated by InOrder, or they may also be customized. InOrder supports both gift certificates and gift cards, which means you can chose one or both – as your business demands. 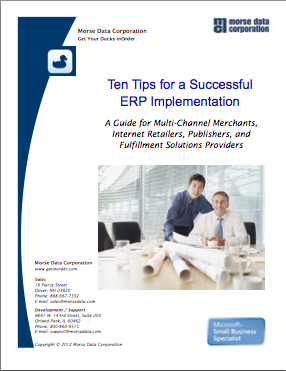 Both provide convenient purchase and redemption across all channels, including Customer Service, Web, and Point of Sale. InOrder gift cards and gift certificates both work with Emails InOrder and the InOrder Digital Delivery Enhancement for immediate delivery to your customers and your recipients. Use this comparison to help decide which features your business needs. For more information about the InOrder Gift Certificate and Gift Card Enhancements and how they can increase your sales, contact sales@morsedata.com.